Mu Theta has had an exceptional year. We had the highest GPA of all IFC and NPHC fraternities during the 2017-2018 school year and were accepted as associate members of the Interfraternity Council (IFC). Our colony raised more than $1,000 for the Official Philanthropy Program (OPP) during Founders Day. One of our Brothers helped plan the Homecoming blood drive, which is the largest single day blood drive in the United States. More than half of the brotherhood donated or volunteered at this blood drive. Brother Jake Poler (2019) interned with the applied physics REU at the University of South Florida and had his research published. We hosted two blood drives that collected more than 70 pints, which is enough to save approximately 210 lives. Mu Theta also hosted Pie a Pi with Alpha Delta Pi and Alpha Omicron Pi, raising approximately $600. In fall 2018, we initiated six new Brothers. We also hosted a Two Days Against Hate program that brought the student body together against hate and anti-Semitism. We brought to campus former neo-Nazi, T.M. Garret, and a representative from the Simon Wiesenthal Center, Melissa Weiss. Our colony also helped Habitat for Humanity with some of their builds and participated in multiple street cleanups this year. We dedicate ourselves to helping the community and raised close to $500 for the Watagau Humane Society, helped clean up the football stadium after a football game and assisted new students moving into their dorms in the fall. We won Outstanding Delegation at International Convention in Phoenix this year. We also were recognized as Best New Student Organization of the 2017-2018 school year at the Student Organization Leadership Awards (SOLA). 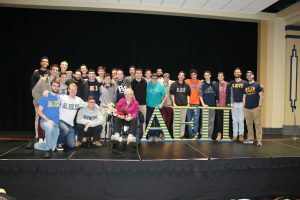 We were happy to sponsor and host Holocaust survivor Dr. Susan Cernyak-Spatz to speak at App State and co-hosted an event with Hillel that raised $389.51 for Sharsharet. On Sunday, February 25, Alpha Sigma was re-chartered after West Coast conclave. Countless Alpha Sigma alumni, Past Supreme Master Elan Carr (UC Berkeley, 1990) and Supreme Master Jeff Jacobson (Northern Arizona, 1992) were in attendance. This semester, we initiated 17 new Brothers in the Epsilon pledge class. 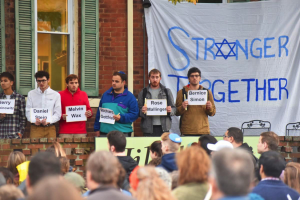 More than two dozen Brothers took the initiative to plan and coordinate an ASU community vigil for the victims of the Tree of Life Synagogue attack in Pittsburgh, easily making this the highlight of our fall semester. The event brought many members of the Jewish community together and had more than 300 people in attendance. Both Lieutenant Master Jacob Wirtzer (2020) and Scribe Daniel Magat (2020) attended a regional training seminar for AIPAC in Los Angeles to help develop advocacy skills to promote a strong U.S.-Israel relationship on campus. As the end of the semester approaches, we are working with Chabad, Hillel and Jewish Arizonans on Campus to co-host a Chanukah menorah lighting in the center of campus, followed by a party and gift exchange. We participated in philanthropy events for six different sororities this semester, and are planning our own event with Krav Maga experts in the Spring. Working hard to earn our charter, Theta has had plenty of successes as a colony. We were re-founded in 2014 and currently have 18 Brothers, with our last initiated pledge class of seven new members being our largest. Our colony traveled to Tuscaloosa, Alabama to attend the Iota Deuteron chartering at the University of Alabama. The past few years, we have held benefit nights at our local BugerFi restaurant. We look forward to planning an AEPuppies event in spring 2019. While our campus has a small Jewish population, we are proud of our strong Jewish identity. We have Jewish themed parties and co-sponsored events with our Hillel. We are currently ranked third in GPA on campus with hopes to achieve better next semester. The brothers of Theta would also like to give a shout out to Jeremy Newman (2019), who is graduating in the spring. He spent two years as the chapter master and helped get us on our feet. We would not be where we are without him. Vav/Israel Zeta colony was founded on May 14, 2017. Although we are fairly new, we are driven Brothers and look forward to our chartering ceremony on December 31, 2018 in Tel Aviv. We have held countless brotherhood events to bring together everyone in the colony and have successfully executed rush events throughout the year to recruit more Brothers. We have attended two International Conventions since our founding and were ecstatic to learn we would be chartered in Phoenix this year. In January, we held an event where two outside lecturers came to present to more than 70 people about having a different financial state of mind and the tools to set financial goals. We have raised more than $370, which was donated to AEPi’s Official Philanthropy Program (OPP), the Repair the World Fund and other beneficiaries. In February, eight of our Brothers went to Schneider’s Hospital to spend time with kids there. 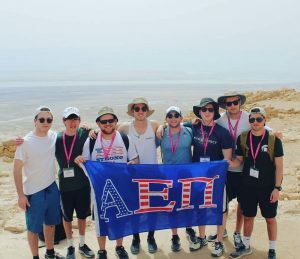 AEPi is thriving in Israel. We hope to see you some time! Beta Nu chapter is still very young, but we are proudly accomplishing many incredible things in the fields of academic excellence, philanthropy, leadership and Jewish Identity. In April 2018, we raised more than $15,000 during our fourth annual Rock-A-Thon, making it the most successful philanthropy event in Beta Nu history. We raised more than any other Greek organization on Binghamton’s campus. We also held our third annual Dog Days philanthropy event in October 2018 where Brothers grilled hotdogs and hamburgers in the center of campus. Academically, the chapter was recognized with the Binghamton University Interfraternity Council Highest GPA award. In March 2018, the chapter swabbed more than 1,000 students in a Gift of Life Bone Marrow Mega Drive. We continue to celebrate our Jewish Identity, hosting Shabbat dinners and events for every Jewish holiday. 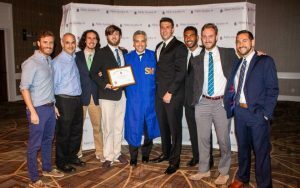 At AEPi’s 105th International Convention in Phoenix last summer, the chapter was awarded first place in risk management, proving that above all, we value our Brothers’ safety and are community leaders in our efforts to do so. We have had a great semester, with a positive rush experience allowing us to achieve positive growth. We had three new Brothers join Nu Phi in the fall. We are in the process of planning philanthropy and Jewish events for next semester, including a Shabbat dinner, Pie a Pi and more. Chapter Master Justin Ramo-Gisser (2020) helped with a greek life philanthropy event as our representative, helping collect non-perishable food donations for Community Care of St. Catharines. Brother Grant Richmond (2019) has also recently completed an internship with the Ottawa Senators of the NHL. We look forward to a positive second semester during this academic year. The fall quarter of 2018 has been a massive success for Sigma Omega! After a strong rush week, we were fortunate to have a pledge class of 17 quality Cal Poly students. They are on track to become not only excellent Brothers, but also some of the finest members of the San Luis Obispo Jewish community. Among our achievements this quarter are the many philanthropy events we have hosted, participated in, and planned. Philanthropy Chair Jordan Roth (2021) has been stellar in his role. He spearheaded a toiletry drive that collected more than 800 toiletry items, inspired chapter involvement in a Chanukah canned-food drive and facilitated the Sigma Omega chapter’s role in philanthropy events with more than six sororities on campus. Additionally, the chapter plans to send out an alumni newsletter. The newsletter will provide informational updates on chapter events and achievements, as well as information on the San Luis Obispo Jewish community-at-large. The newsletter will help the Sigma Omega chapter form an even deeper connection with our alumni network; a goal which aligns with our core values as a chapter. This year was big for Chi Eta! 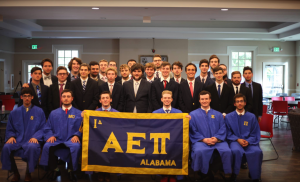 We were chartered on April 21, making us an official chapter of Alpha Epsilon Pi. We started the fall semester off with a very successful rush week, which saw more students rushing our events than ever before. Our Zeta pledge class was just initiated, bringing our total membership to 30 strong. We’ve also been very active in Chico’s Jewish community by signing up multiple brothers for Sinai Scholars, attending weekly Hillel events and Shabbats and even putting on a few Shabbat events of our own. We have a goal of being admitted to the Interfraternity Council, and we’ve taken steps to get there. As a result of Camp Fire, which has widely affected the Chico area, we aim to focus heavily on philanthropy to help the community next semester. We hope to give relief to those affected in our community. 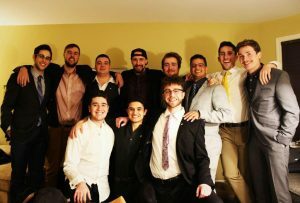 As we move towards affiliation with the school, the new executive board hopes to maintain and solidify a positive Jewish fraternal culture on campus. We look forward to a great year! We were proud to accept our charter on April 23, 2017. Gamma Rho has had a great fall 2018. We recently elected our new executive board, which will do amazing in the coming year. Last spring we sent four brothers to Conclave at Arizona State University; they learned many valuable things and connected with different brothers from chapters all around our region. This semester we initiated four new Brothers. They quickly took on roles to serve the chapter after initiation. Our Brothers enjoyed a retreat away together in the Colorado mountains. Several alumni in the area joined us for this retreat. We recently held a philanthropy event at Chipotle. Hosting this gave us the opportunity to raise money for Gift of Life Marrow Registry while better preparing for our annual AEPuppies philanthropy in the spring. Brothers also enjoyed a wonderful meal together at Jay’s Bistro in Fort Collins. The dinner enabled the entire chapter to get together one last time before winding down for finals and parting ways for winter break. 2018 has been a remarkable year for Iota. 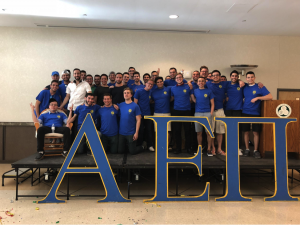 We have seen record rush results and two outstanding pledge classes eager to advance the traditions and mission of AEPi for future Brothers and the Columbia community. We have eagerly met our philanthropic objectives and have done more to engage with local charities such as Harlem Grown, where Brothers have volunteered on an urban farm. Early in the year, Iota rekindled a long-standing partnership with Chabad on campus. Together, we hosted a Shabbat dinner at the Chabad house which was very well received and attended by a majority of the brotherhood. 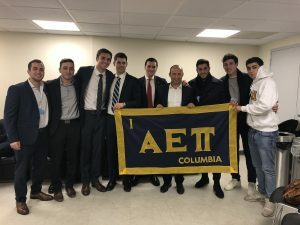 In March, we hosted Israel’s Minister of Education and Diaspora Affairs, Naftali Bennett, who visited to give a speech to all Columbia students about the Israel-diaspora relationship. 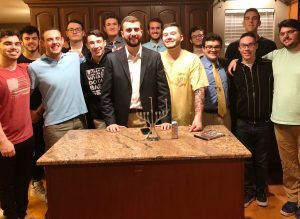 Following the speech, Minister Bennett met with Iota’s executive board for an in-depth discussion about Jewish life on campus and was initiated as an honorary Brother of the chapter. 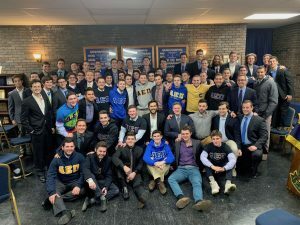 In 2019, AEPi will continue to be a beacon of light at Columbia University. We will develop future Jewish leaders and continue to be a powerful Jewish voice on campus. Beta Chapter always has at least one Brother on the Hillel executive board every semester. We also have many Brothers that are a part of various Hillel committees. We are actively engaged with Jewish events and are happy that this semester we received two new Brothers, Aaron Lippman (2022) and Harrison Stern (2021). Brother Eitan Wolf (2021) also transferred from Oregon State University. We currently have the highest GPA of all fraternities at Cornell University. Beta takes part in many philanthropic events such as Big-Red-Thon and community service events like Greeks Give Back. Every year, we host a break fast for Yom Kippur, which always has a great turn out. We look forward to a fun rush and wish the best of luck to all our graduating Brothers. Alpha Gamma had plenty to celebrate after another successful year in the Maritimes. In 2018, our colony engaged in some of the most meaningful events in its young history. We have helped our community grow stronger in various ways. 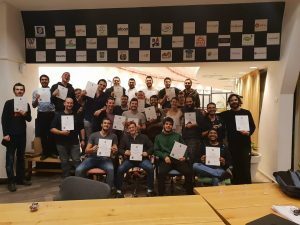 At the beginning of the year, Brother Eliran Penkar (2019) organized free Krav Maga nights for community members. The first session was for women and the second was open to the community. These sessions were organized to help all university students learn skills to help them feel safer on campus through useful Israeli martial art. In the Jewish community, Brothers played a significant role in engaging others in holiday and Shabbat celebrations. We ran programs with both Hillel Atlantic and the local synagogues. In the Greek community, our colony has played a large role in organizing events including Christmakkah, allowing for all Greek organization to come together and celebrate their various religious backgrounds for the holidays. 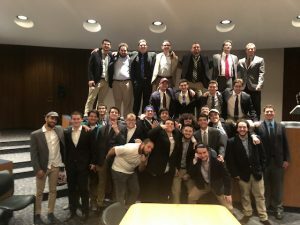 Our colony has had the pleasure of watching Brothers and alumni succeed whether it’s working in parliament, going through rabbinical school, being accepted into law school, working in cancer research or achieving excellent marks overall. Although a small group, Alpha Gamma colony has made amazing advancements forward this year. It’s been another year of success for the Brothers of the Delta Rho chapter. Through our two biggest philanthropy events, Latke Fest and AEPi in Your Eye, we raised more than $8,600. This year we focused on having philanthropy events that were fun to host and attend as well as informative and meaningful. For the second year in a row, Delta Rho was awarded the Louis Sherr Outstanding Chapter revere bowl. We’re beyond proud of this accomplishment. Our Brothers have been active in leadership around Drexel’s campus. Past Master Jon Coopersmith (2020) is currently serving as President of Hillel and Vice President of Recruitment for IFC. Gav Blaxberg (2021) and Matthew Clewley (2022) are serving on the Executive Committee for the 24th ward of Philadelphia, Division 10, which defines a small area of Powelton Village where our house is located. To honor our Philadelphia sports teams, our Rush theme this year was #RushTheProcess, and we proudly inducted 28 new Brothers into our ranks. 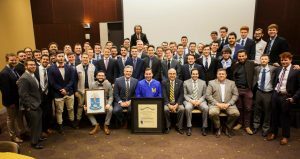 The Epsilon Phi Colony of the Alpha Epsilon Pi Fraternity has seen a massive growth in numbers and accomplishments in the fall of 2018. Ten members of our Alpha pledge class were initiated as Brothers in the fall. We now have a strong brotherhood of 28. Our Jewish events have gone very well this semester. We hosted a Shiva informational event that saw an attendance of 56 at Hillel. This program was led by brother Daniel Schiff (2021). We also had a memorial for the victims of the Pittsburgh shooting led by Brothers Noah Lakind (2020) and Adam Tommer (2021) which was well-received by Jewish life on campus. We saw close to 75 people in the Student Union. Brothers have helped out at Chabad, Hillel and Dream Align over the semester in an effort to give back to the community. Many Brothers have done well academically this semester and look forward to spring 2019. 2018 has been a great year filled with fantastic memories for Phi Alpha. In the fall, we held our first annual AEPalooza dance competition for philanthropy, raising close to $4,000 in one week. Both of our formals this year were a huge success. We went to Daytona, Florida in the Spring and St. Petersburg, Florida in the fall. This was an excellent experience for all of our Brothers and their dates. Throughout the year, we also kept true to our Jewish faith and had multiple events and delicious Shabbat dinners. We partnered with Hillel and had a brotherhood Shabbat dinner with food brought in by a local Kosher restaurant. Our Beta Mu pledge class in the spring and Beta Nu pledge class in the fall brought many talented and bright young minds into Phi Alpha. We are all excited to see what they can do to help us reach new heights. Our fearless leader and past chapter master, Adin Jacobs (2019), finally stepped down after serving three terms. He truly led this chapter to be as strong as it is now. Everyone is looking forward to what 2019 will bring. Eta Sigma chapter at Georgetown University has had an amazing 2018. 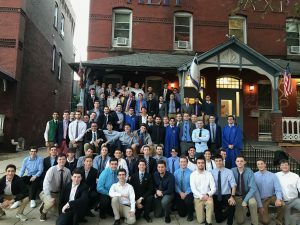 Now at 81 Brothers, our chapter continues to grow fast as more Georgetown students look to find their Jewish home at the Catholic institution. We had a Brother retreat in the Shenandoah Mountains in March and six new Brothers initiated in the spring rush class. We also hosted a We Walk to Remember (WW2R) program on YomHaShoah to remember those that died in the Holocaust. 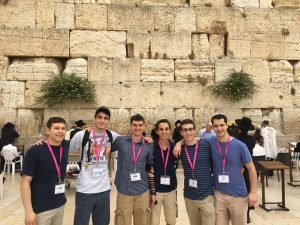 Several Brothers participated in a Birthright trip with the larger Georgetown Jewish community over the summer. In the fall, we welcomed nineteen new Brothers into our Fraternity. Brother Sam Dern (2020) was named the intramural ping-pong tournament champion, and we had our cornerstone philanthropy event: AEPie in the Face. Brothers have continued to have professional success once they leave the Hilltop, working for companies like Bain & Co, Morgan Stanley and Citigroup. We look forward to continued growth of our chapter in the semesters to come. Zeta Brothers are pleased to announce the success of their first semester in the new house at 714 Techwood Drive! 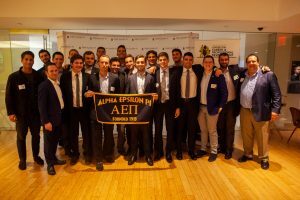 The official opening on October 13 was a huge success with alumni and friends of the Fraternity, including AEPi Foundation CEO Andy Borans, traveling from across the country to witness the grand opening. 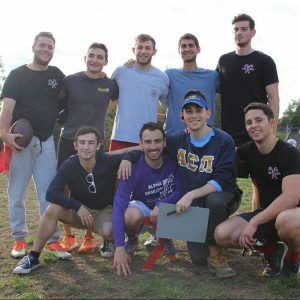 As Brothers are learning to adapt to their new living quarters, they are also actively participating in intramural sports, academics and extracurricular activities. This year, our intramural ultimate frisbee team took home the gold medal for undergraduate teams and the second place medal for all teams. Academically, we are on track to be among the top five fraternities for GPA and Brothers are working harder than ever to maintain this achievement. 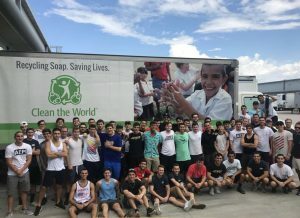 Our Brothers demonstrated excellence in leadership and comradery during the hurricane season when we opened our doors to Brothers from the South Florida region who were evacuated from their homes. We have bonded as a chapter with semester-long competitions, frequent bonfire outings and fraternity trips both on and off-campus. The Brothers of the Zeta chapter will continue to grow and bond for years to come. Delta Gamma has seen immense success in 2018. Between spring and fall rush, nine hard-working and dedicated Brothers have been added to the chapter. The fall 2018 class was initiated with 100% retention. In winter 2018, Delta Gamma raised more than $500 for AEPi’s Official Philanthropy Program (OPP) and the Repair the World Fund. We have registered more than 200 people as potential bone marrow donors for Gift of Life Marrow Registry. Delta Gamma holds a cumulative chapter GPA of 3.29 and also has the highest GPA in the GVSU Interfraternity Council (IFC). Delta Gamma is heavily involved in campus activities, we have five Brothers in the Grand Valley Student Senate. Delta Gamma has also comprised more than 250 community service hours in the calendar year. Master Morgan Mattler (2020) received the Most Outstanding Delegate award at International Convention in Phoenix last summer. Delta Gamma partnered with Gamma Phi Beta for 2018 Greek Week and placed third. We also brought more than 300 people together for a vigil after the Pittsburgh Synagogue shooting. The University President, Provost and Dean of Students all were there to share their condolences. 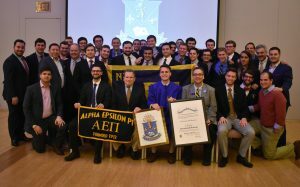 This semester we were happy to receive our charter, making us an official chapter of Alpha Epsilon Pi. We held our second annual philanthropic event, AEPilooza. This is a music festival with a handful of local bands that perform. One of the bands has two Brothers in it. Our biggest achievement this semester was co-hosting a candlelight vigil for those who passed in the Pittsburgh shooting. The event was a put together by Iota Beta, Hillel and Chabad. More than 300 people from all different backgrounds came, this is a big deal to us since Illinois State University has a very small Jewish population. 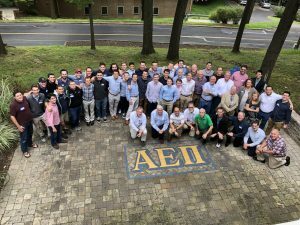 This year, we did an executive board retreat at AEPi Headquarters in Indianapolis and had our chapter master attend the Illinois State Greek Life presidents’ retreat. Thirteen Brothers attended Midwest conclave at Purdue University and one Brother joined the Interfraternity Council Cabinet. Psi Chapter has had a fantastic 2018. We welcomed our Zeta Deuteron pledge class of 14 to the brotherhood thanks to pledgemaster Brother Harry Goldin (2018) and former chapter master Brother Jon Smith (2018). This class already has five Brothers on our new executive board: Brothers Avery Ostro (2021), Josh Krachman (2021), Isaac Lucas (2021), Jared Dallas (2021) and Nathan Safran (2020). In May, we celebrated our annual brotherhood retreat at Gunpowder Falls State Park! This fall, we expanded our philanthropy efforts and partnered with the campus Hillel house to sell challah. Proceeds benefited the Tree of Life Congregation in Pittsburgh. Additionally, we held our first holiday latke sale in December to fundraise for the Hope Time Cure Foundation for children’s epilepsy. This initiative was led by our sentinel, Brother Jared Dallas, and chapter master, Sean Jost (2019). In November, we welcomed back the Psi chapter pledge class of 1969 to see the same house they lived in 49 years ago! 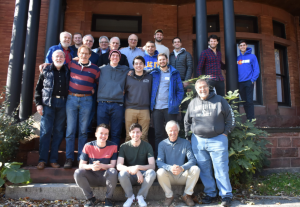 Organized by Brother James Lubowsky (2019) and alumnus David Brainerd (1969), we were happy to have them and can’t wait to see them again for their 50th anniversary reunion in the spring! The relatively new colony at Johnson and Wales was founded on November 7, 2015. 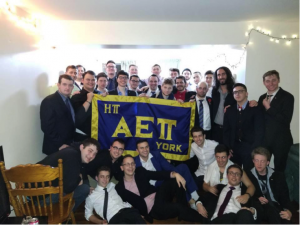 In 2017, Omega Gamma was recognized as an organization on campus and currently has nine Jewish Brothers who embody the aspects of being an AEPi. Brothers focus not only on their community service, but want to work hard to earn their charter in the next year. In order to have a strong Jewish community, they reach out to Johnson and Wales students as well as those at Brown University and Rhode Island School of Design (RISD). Together, they share Hillel on campus. Omega Gamma has created a foundation for themselves to build on at Johnson & Wales and look forward to the future. 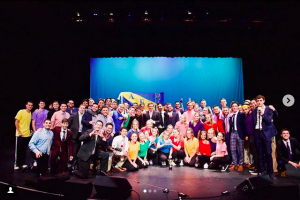 The fall 2018 semester marked several successes for Phi Deuteron. In late October, the chapter initiated ten new Brothers from the Gamma Delta pledge class, our largest pledge class in six years. Brothers also participated in several philanthropy events hosted by sororities. We raised the most money of any chapter at Kent State in Phi Mu’s annual Miracle Crown event. In November, executive board elections were held; Brother Jason Cohen (2020) was elected as the chapter’s new master. The chapter also held its annual philanthropic event, Latkefest, on November 29th. We raised more than $4,000 dollars for AEPi’s Official Philanthropy Program. The first of our semi-annual formal events were also held this semester, at the Tangier Ballroom in Akron, Ohio. Phi Deuteron also welcomed Rabbi Moshe Sasonkin and Chabad on campus in Summer 2017. Chapter morale remains high as the Brothers look forward to the Spring 2019 semester. All in all we’ve had a fantastic semester here at Kennesaw State! We are wrapping up our first fall semester on campus as an official chapter of the Interfraternity Council (IFC) and were able to initiate eight new brothers into our colony! One highlight we’re proud of from was participating in the Atlanta Kosher BBQ, where we were able to win second place in brisket! The event itself was a blast with AEPi alumni approaching our tent left and right. It was a great way to be active in our community and we intend to make an annual appearance. Another highlight was Shabbat across AEPi. We co-hosted a Shabbat dinner with our campus Chabad and helped prepare and clean up the event. We had a huge turn-out for a festive and delicious meal sponsored by Gamma Pi. 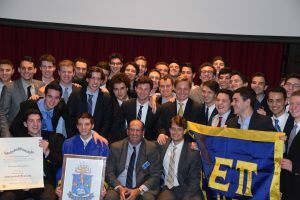 Founded in 2015 by Lauder Business School student David Rozsa (2016), the Phi Eta Colony in Vienna, Austria is living proof that AEPi can develop Jewish leaders in central Europe. AEPi Vienna is special for many reasons. We have several nationalities present amongst the Brothers. Brothers not only speak English, but also Spanish, German, Russian, Ukrainian and Hungarian. 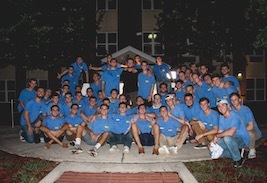 This year, AEPi Vienna has grown to an outstanding 23 Brothers. Despite our previous smaller size, we have the third largest Instagram account within AEPi. One of our signature annual events is collecting clothing in good condition for the homeless. Additionally, since most of us are business school students, we’ve developed a case study competition with the cooperation of the “Is it Kosher?” app as a part of the pledge program. The goal is to work as a team to develop the best strategy to introduce the app to the Austrian market. 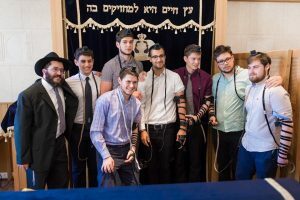 In summer 2017, in cooperation with campus Rabbi Boruch Sabbach, five Brothers performed their Bar Mitzvah ceremony, making it the biggest AEPi Bar Mitzvah in AEPi´s history! Fall 2018 semester has been exciting for Sigma Eta. We acquired a new chapter house on the Hill (House 102, formerly Sigma Chi). The new house bring a lot of excitement about our future for the Brothers. Twenty-one Brothers currently live in the house with a mezuzah on every door. Alumni welcomed the home during our alumni event and Lehigh-Lafayette rivalry game. Sigma Eta has been working hard on a recurring chapter event, AEPi Sunday Clean Up. In 2017, the Brothers worked with other Greek and student organizations at Lehigh to clean up the Bethlehem community. 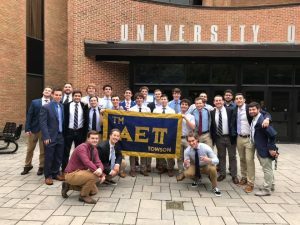 From Greek emerging leadership programs to assistance with freshman move-in, our chapter is hard-at-work maintaining our reputation with the school and developing Brothers into future Jewish leaders. With spring recruitment right around the corner, Sigma Eta is excited to see the growth of our chapter and what the future has in store. Alpha chapter is strong 105 years after its founding. This fall, we initiated 33 new Brothers in the largest pledge class Alpha has seen in years. We plan on taking 20 more in the spring. We were in the top five AEPi chapters for philanthropy last year and received an award during convention in August recognizing us for our contributions to philanthropy. Tikkun Olam is a core value for AEPi, so next semester we will be dedicating ourselves to serving our own community in NYC. Brothers will be running a Gotta Have Sole Ambassador Program in NYC, going into homeless shelters and teaching homeless children social empathy skills through the organization’s curriculum over a six-week program. Our chapter was chartered on December 9, 2017, officially making us a chapter of the Alpha Epsilon Pi Fraternity. We had Past Supreme Master Scott Cohon (Wayne State, 1991) and Past Supreme Master A. Edward Scherer (Worcester Polytechnic, 1963) in attendance. Associate Director for Fraternity & Sorority Life Christopher Jefferson expressed his pleasure working with our Brothers since the founding father class. He said he wishes more chapters were as true to their values as us. On November 3, 2018, we received the John T. Caldwell Cup at halftime of the homecoming game. This is the second year in a row that we have won this honor. 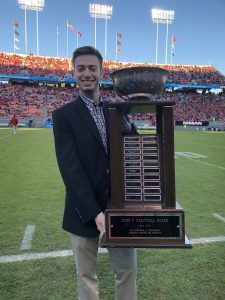 Named for former NC State Chancellor John T. Caldwell, the Caldwell Cup is the highest annual recognition that any IFC chapter receives. To be considered for the award, a chapter must excel in the following areas: Academics, Athletics, Greek Life standards, Alumni relations, Campus leadership and involvement, Council involvement, Educational programming, Finances, Leadership training, Membership, Risk management, Scholarships, Philanthropy and IFC participation. Sigma Kappa Psi has had an exciting and productive year as a chapter. We were part of two big fundraising events in the spring: Relay for Life and our annual chapter event, Jews Cruise. Jews Cruise raised more than $9,000 for the Gift of Life Marrow Registry. Our chapter has also increased its focus on Jewish identity. This semester, we held a Shabbat dinner for our Brothers. We discussed issues facing the Jewish community today and how we can work to stick together. We also visited a special Holocaust exhibit in the Boston Commons and followed up with an engaging discussion together. We have also focused on developing a larger role as leaders in the Greek life community. In the spring, we brought Pete Davidson to Northeastern for the Greek life and Northeastern community to enjoy. This semester, SKP won the bi-annual Greek life dance competition with Homecoming partner Sigma Delta Tau. We also won the annual philanthropy football tournament put on by Kappa Kappa Gamma. It has been an exciting year for our chapter and we hope to continue to rise as leaders. Omicron Upsilon and the Greek Life community at Ohio University community have excelled in taking the initiative to increase attention, both locally and nationally, about sexual assault awareness. This semester, other Greek organizations followed our lead by hanging banners on campus that said, “No Does Not Mean Convince Me.” These banners went viral and had 20 million views nationwide, portraying our united stance against sexual assault on campus. We also led the charge in hanging Stronger Together banners that raised awareness surrounding acts of anti-Semitism in the United States, including the Pittsburgh Synagogue shooting. Together, every Jewish organization in Athens, including Hillel and Chabad, banded together to bake and sell challah. The campaign raised more than $1,000 for Tree of Life Synagogue in two days. Omicron Upsilon is constantly doing whatever it can to make a positive difference nationally and in its local community. We couldn’t be more proud to announce that the Jewish community in Athens is stronger than it has ever been. Last spring, our colony was officially recognized as a fraternity on campus by the Interfraternity Council (IFC). Although we’re small, every chapter on campus gets to participate in Greek events. One of the biggest spring IFC events is Greek Week. During the week, all the fraternities and sororities that are a part of IFC are split up into teams of four chapters each. Every team participates in multiple events such as tug-of-war, dodgeball and volunteer hours. Teams can get points by performing well at events, having many members attend events and wearing Greek clothing during the week. We were placed on team Libra along with Delta Gamma, Alpha Tau Epsilon, and Acacia. At the end of the week, we won second place! This was a huge first step in establishing our fraternity’s presence on campus. It has been a phenomenal semester for Pi Deuteron/Phi Sigma Delta Sigma. We won Penn State’s intramural softball championship after a very exciting season. We also enjoyed a weekend where many alumni visited the house and shared fond memories of their time in college. Our chapter participated in numerous philanthropic events to give back to the community. We raised more than $1,000 to help pay for the cancer treatment of our head chef, Anthony. Additionally, we raised more than $2,000 for the Tree of Life Synagogue by selling Stronger than Hate t-shirts. We’ve made sure to stay active in the Jewish community by attending Shabbat services regularly, building a sukkah in our backyard and even putting up a nine-foot Menorah for Chanukah! We are very proud of Brother and former chapter master, Daniel Schneiderman (2020), who was elected Executive Vice President of the Interfraternity Council. 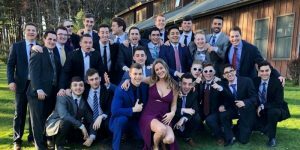 It really was a special semester for Penn State’s AEPi chapter. It has been an eventful year for the Brothers of Pi Upsilon. As of right now, we have 74 Brothers. We have recently initiated a new pledge class of 22 outstanding young men. Our goal for spring rush is 8-15 new Brothers. This semester, Brothers participated in sukkah building, lighting the Chanukah candles, attending high holiday services and playing a major role in the success of our Hillel. In October, Brothers volunteered at the West Lafayette Zoo and helped set up and tear down for their annual Halloween show. Brothers engaged with the community while getting in the spirit of Halloween. This spring, we plan to host AECounty Fair where we will have animals, games and food to raise money for Gift of Life Marrow Registry. Brothers participated in indoor soccer, flag football, indoor hockey and other intramurals this semester. We are looking forward to a great spring semester here at Purdue! Nu Eta held its first annual sumo wrestling philanthropy event. This event put other Greek members from the school in a head-to-head bracket, the winner of both the men and women’s bracket had money donated back to their national philanthropy. The sumo event was a hit in the Quinnipiac community, raising more than $1,500. It’s success got us recognition for the the philanthropy event of the year by the Interfraternity Council (IFC). On top of that honor, Nu Eta also won the most outstanding new member class and highest overall GPA of all other IFC groups. 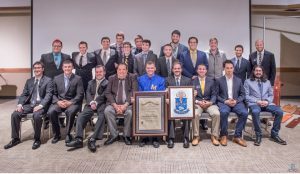 We were re-founded in 2015 and were given our charter in November by the Supreme Board of Governors of Alpha Epsilon Pi. Our chapter has had an incredible year, and we look forward to all the work we plan on doing in the upcoming year. This year, the Brothers of Gamma Upsilon celebrated their first Pi Week, a week of events dedicated to philanthropy and service initiatives. We held our first AEPrincess Pageant, which was the focal point of the week. We crowned two princesses at the event. The event raised $585, which put us over our fundraising goal for the semester. Pie a Pi proved to be a great success during Pi Week for Gamma Upsilon. Civics Chairman Ian Nielsen (2020) helped us orgnize a campus clean-up with Alpha Sigma Tau sorority and we cleaned trash across Rowan’s campus. Gamma Upsilon also hosted a Krav Maga class led by Chapter Advisor Don Melnick (Rider, 1993). He held a two-hour introductory course for more than 30 students. We were also happy to be chartered and made an official chapter of Alpha Epsilon Pi on December 2, 2017. 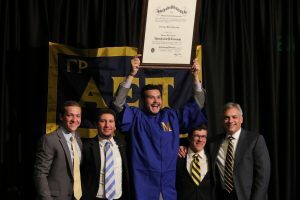 At AEPi’s 105th International Convention in Phoenix, Arizona, Brother Daryn Karp (2021) was awarded the Andrew S. Borans Outstanding Pledgemaster Award! Fall semester for Pi Rho was one for the books. The chapter had an extremely successful rush week with impeccable Brother attendance. We kicked things off with a pong tournament and ended with our bi-annual free wings night. This resulted in a dedicated pledge class of six Brothers. The momentum didn’t stop there. Our chapter had multiple Jewish events this semester such as Shabbat dinners with Rabbi Jaffit. Brothers had the opportunity to discuss their Jewish values and bring us closer to our ties with the Jewish community at Ryerson. 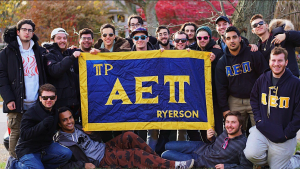 Brothers took a road trip from November 16-18 to attend Eta Theta chapter’s annual Splash Bash event at the University of Guelph. Pi Rho also brought 25 Brothers and three alumni to the Chabad house at Guelph. Doing so allowed us to expand our connection with the Brothers at Guelph as well as the Jewish community in the area. In the past year, Chi Psi has accomplished many things to boost morale and create a stronger sense of brotherhood. Together we continue to develop our identity on campus and within our surrounding community. We have hosted several of our own successful philanthropy events to benefit the Save a Child’s Heart Foundation as well as the victims of the Camp Fire that devastated Paradise, California. We have continued to focus on developing our relations with other Greek organizations on campus by hosting socials as well as participating in their philanthropies. Brother Kyle Dunne (2019)ran for Alpha Xi Delta’s Xi Man and Alex Nemchinov (2019) ran for Delta Gamma’s Anchorman. We have also had a strong focus on building our relations with the surrounding Jewish community. We have partnered with Hillel of Silicon Valley to host several Greek Shabbats at our chapter house. We also partnered with Chabad of San Jose to organize a Jewish Heritage Night during one of our home football games. We have continued help our local community by volunteering at the annual Menorahs and Miracles event held at the Children’s Discovery Museum in San Jose. Chi Psi is proud of the work it’s done and is eager to continue its growth in the coming year. Upsilon Kappa Alpha has had a very successful semester. We started strong adding a record 15 new Brothers from a diverse group of countries such as Turkey, Canada, and crucially, Scotland. The passion and commitment that these new Brothers have shown is evident. Two of them, Ben Clark (2021) and Tye Brown-Wolf (2021) have taken up executive board positions of Scribe and Rush Chair, respectively. Additionally, the chapter recently completed its fifth annual Charity Beach Relay for the Anthony Nolan Trust. This relay went for 100 hours, with the chapter raising more than 4,000 pounds ($5,200); this allows Anthony Nolan to add more than 100 people to its Bone Marrow Donation Registry. 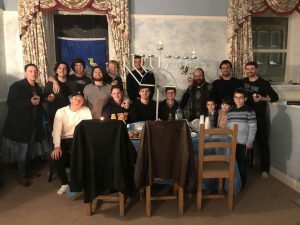 Additionally, the chapter had its strongest semester of Jewish events to date, holding multiple events with the Jewish Society and recently having the Edinburgh Chabad Rabbi come up for a Chanukah candle lighting. Brothers look forward to next semester where many new exciting events await such as our second charity campaign and our sixth annual Founders Day Dinner. Chanukah Sameach to all Brothers around the world! Phi Beta has had many accomplishments in its first full year of recognition by Stockton University. On April 12, during Yom HaShoah, we held We Walk to Remember, where they silently marched with members of the Stockton community in remembrance of the six million Jews who perished in the Holocaust. We also partnered with Stockton Chabad to bake challah for the Community Foodbank of New Jersey. The Greek community at Stockton has been very welcoming to Phi Beta during their first year. We worked with Sigma Pi to co-host Pie on Pi, a pie-eating competition where the proceeds were donated to the Covenant House to help homeless youth. Phi Beta alumni have also found success following their graduation. Former Lieutenant Master Zachary Raphael (2018) currently works for the New Jersey office of Homeland Security and Preparedness. He recently had a hand in creating NJOHSP’s first-ever full-scale exercise, involving law enforcement and first responder agencies from 18 different jurisdictions. Former Exchequer Tyler Goldstein (2018) helped open Sandler’s on Ninth Street in center city Philadelphia, which went on to reach the accolades of Best New Restaurant on Open Table and Top 20 New Restaurant in Philly. Phi Beta is on track to have 20 Brothers next year and hopes to continue working towards receiving its charter. Since we were started three years ago, the Omega Zeta Alpha Chapter has had grown to almost 60 Brothers. We were also chartered on Saturday, May 5. 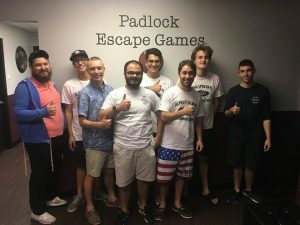 We held a charitable event organized by our Philanthropy Chair, Mitchell Shelton (2019). With more than 40 guests in attendance, our fraternity house was certainly filled! It was a classy night, with guests enjoying a variety of food and drink samples. Running an event of this nature was an extremely rewarding experience for our Brothers, and our chapter takes great pride in contributing to AEPi’s Official Philanthropy Program and Repair the World Fund. Our philanthropic endeavors were a great success, raising more than $600 for the Israel Children’s Cancer Foundation! 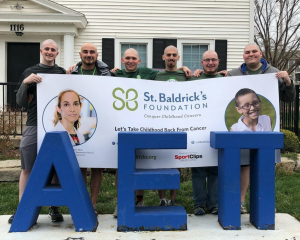 We look forward to supporting the AEPi charities of choice in an even larger philanthropic year in 2019! Midyear, the Brothers traveled south to Hyams Beach on a road-trip, where they spent several days enjoying a brotherhood retreat at a beach house. Five of our Brothers went on exchange over the course of the year to both the United States and Japan, linking up with AEPi chapters at their exchange universities in the United States. We had a strong delegation of Brothers representing Omega Zeta Alpha at AEPi’s 105th International Convention in Phoenix, Arizona. We were awarded The Philip & Susan Cohen Jewish Communal Activity Award for contribution to the Sydney Jewish community. Two Sydney Brothers also attended conclave in the UK this year. Brother Ben Ezzes (2020) was awarded the prestigious Nehemiah Gitelson Medallion, being selected as one of only three Brothers across AEPi internationally for his contributions to the Sydney Jewish community. He also received the Jewish Innovation Award at the Sinai Scholars Symposium in Chicago for his paper on Jewish Education. 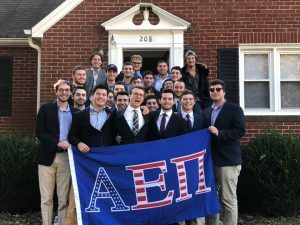 Brother Colby Wigoder (2020) spent the first few weeks of January doing an internship with AEPi Headquarters in Indianapolis, visiting a number of chapters, as well as participating in the Israel Summit. We look forward to an even more eventful and prosperous 2019. This semester has been very productive for Lambda Mu. The colony was re-founded at the beginning of the semester. After the re-founding, we initiated seven new Brothers which doubled our size as a colony. Our founding fathers have bonded and created memories that will build a better colony for the future. In November, we partnered with the Rohr Chabad Jewish Center at Texas A&M to co-sponsor a Shabbat dinner in recognition of Shabbat Across AEPi. This event was full of laughs and great memories. More than 100 people showed up to this Shabbat dinner. We are using this event as a stepping stone to make a real impact in the Jewish community at Texas A&M. We had a great philanthropy event on Veteran’s Day that raised more than $200 for AEPi’s Official Philanthropy Program. We had brotherhood and social events this semester that allowed our Brothers to bond closer with one another. This semester had its highs and lows, but it was an overall success that will set us up for success in the coming year. Tau Mu has had a record-breaking year and we are extremely excited to share our success with all of AEPi. We put together an anti-hate rally drawing in more than 500 people from Towson’s campus and the surrounding community. For our alumni weekend, we had a 25 alumni come home to meet the current chapter Brothers and reminisce with one another. We saw an amazing rush this year, Tau Mu initiated a 15 person pledge class as Brothers. This doubled the chapter size in one semester. 2017-2018 was an amazing year for Tau Mu and we can’t wait to continue the amazing work we are doing at Towson. Iota Deuteron is excelling at the University of Alabama. 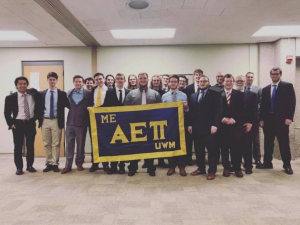 Now a chapter of Alpha Epsilon Pi, our size has tripled since our re-founding in March 2017. We have raised more than $3,000 in philanthropy and broken many milestones in our short time on campus. Our Beta class of seven Brothers was initiated in February. Two Brothers attended Southeastern Conclave at UCF in February and David Saxe (2020) won most outstanding delegate. At AEPi 105 in Phoenix, we won the Marc and Dana Katz Most Outstanding Colony Award. Several Brothers have involvement with both Chabad and Hillel on campus. We sponsored the Second Seder night of Passover at Chabad this year. 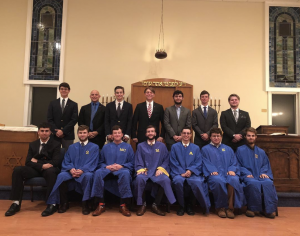 Iota Deuteron Brothers continue to be campus leaders, holding positions in Delta Sigma Pi, Young Americans for Liberty, Chabad and more. We were accepted into the University of Alabama IFC in October 2017. Big things are happening and we aren’t slowing down. Roll Pi! This semester, we took 13 new Brothers who have already brought much to our chapter. 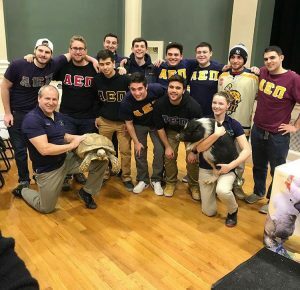 We recently partnered with our local Chabad house to have a toy drive and celebrate the first night of Chanukah with other members of Greek life. 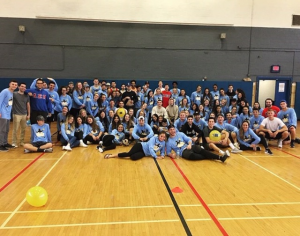 We also had our annual dodging cancer dodge ball tournament and fundraiser with Delta Phi Epsilon. Together, we raised more than $1,000 for Montefiore Children’s Hospital Oncology Department of Research. We also cleaned the local community, University Heights, in Buffalo. We have a new executive board of qualified members to run and guide this brotherhood for the next year to come. This fall, the Beta Chi chapter at UBC initiated 10 new Brothers. They have diverse backgrounds, but bonded extremely well with one another and the rest of the brotherhood throughout their pledge program. We look forward to seeing what they can accomplish as future leaders in the chapter and community. For the first time, the chapter has launched a philanthropy event in the fall term, to complement our successful Hoops 4 Health campaign in the spring. The chapter decided to support the B’nai B’rith International Disaster Relief Fund, a cause very important to AEPi’s Canadian chapters. The event is called AEPuppies, where people can donate to play with dogs and enjoy some sufganiyot in the spirit of Hanukkah. We aim to raise $500 and have the event become an annual staple of Beta Chi’s philanthropy initiatives. We have achieved great success in the university community. At the beginning of the year, we won the Greek-wide Songfest, a musical performance competition. In addition, we won our initial heat and ended up placing second in the UBC-wide Day of the Longboat, a dragon-boat-style race. We hope to continue our successes in the various Greek philanthropy competitions this spring. This year has been very productive and filled with Jewish engagement for Chi Alpha. A primary focus we’ve had this year was fostering relationships with other Jewish organizations in Berkeley. We’ve helped host events like “Poke under the Sukkah” with Chabad and had multiple Shabbat dinners facilitated by Hillel. These events have been greatly beneficial and have allowed Brothers to practice the Jewish values that define our Fraternity. We have also made great strides in creating long-term alumni relations, hosting an event last month that was attended by nearly 100 Brothers and alumni. We are looking forward to continuing our tradition of being leaders in the Jewish and Greek communities of Berkeley. Chi Delta is very excited to share our accomplishments from the year. Our fall quarter has been packed with community service, brotherhood and Jewish involvement events. 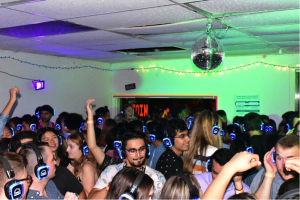 We hosted our third annual silent disco philanthropy event, where we raised more than $5,000 to benefit the California Wildfire Relief Fund. This is especially important in our area due to the worsening air quality from the Camp Fire in Butte County. In addition to this, we hosted numerous social events with the Greek community, including a foam party. 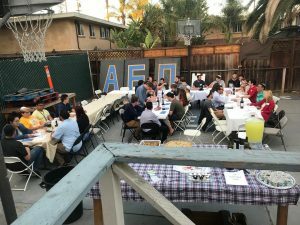 We solidified our Jewish identity and bond with the sisters of Sigma Alpha Epsilon Pi with a Shabbat dinner held in our backyard, following anti-Semitic attacks on campus. This year has been filled with events which continue to strengthen our brotherhood, relations with sororities, and our position as a major Jewish organization on campus. We are excited to share all of this with you and are anticipating an even more exciting year to follow. Saying that 2018 has been an interesting year for our chapter here in La Jolla, California would be an understatement. While the road has been bumpy, we can say with certainty that we have grown and will continue to grow as a result of the adversity faced in the fall. We carried out a successful fall rush and hope to initiate 13 new Brothers of the Alpha Psi pledge class. We retain the highest GPA of any fraternity on campus and have participated in many philanthropic events. Chi Sigma maintains a high morale with hope that the next Executive Board will lead us into the future of the chapter. This year, we had many new event and opportunities available to us. We started off 2018 with our basketball charity called the Winter Classic. We had great participation from the community and it ended up being a very successful event. Sigma Zeta has seen some of its strongest pledge classes come through this year. These new Brothers have helped our chapter increase Jewish presence on and off campus, participating with Hillel, Chabad and Slugs for Israel. Our Exchequer, Johnny Chavez (2019), has helped our chapter excel to another level by securing sponsorship opportunities as well as discounted deals for chapter events. We have been able to do more brotherhood activities and social events with the help of catered food, drinks, prizes and occasionally venues. The most notable sponsorship we have established has been with Woodstock’s Pizza, a favorite California chain. They helped to sponsor nearly every large-scale event we had with them, and it would not have been such a successful or fun year without them. This year, Nu Delta has experienced exponential growth. In the fall semester, we initiated the largest pledge class in the chapter’s history with 33 new Brothers. This allowed us to grow to a brotherhood of 84 strong leaders. As a brotherhood, we volunteered for two amazing organizations, Clean the World and United Against Poverty. Our connection to Jewish values were strengthened through unique programming and co-sponsored events with Chabad and Hillel. These events included Shabbat Across AEPi in the new fraternity house, holding a vigil in memory of those that passed away in the Tree of Life Synagogue and lighting an eight foot Menorah outside the Student Union with UCF President Dale Whittaker. Academically, the chapter has excelled with an overall GPA of 3.17, which was the highest GPA for all fraternities at UCF. Collectively, we were able to raise thousands of dollars benefiting AEPi’s Official Philanthropy Program (OPP) and the Repair the World Foundation. Additionally, six Brothers were elected to the Student Government Association Senate and two Brothers were elected to the Interfraternity Council’s Executive Board. We are currently in the process of acquiring a new and amazing fraternity house that will serve as the main hub of the chapter. The Brothers of Nu Delta will continue their steadfast commitment towards the betterment of the overall chapter and development of tomorrow’s Jewish leaders. The Omicron Deuteron chapter had a strong semester of brotherhood, alumni engagement and philanthropy. Everyone who attended the brotherhood retreat at Pigeon Forge, Tennessee enjoyed exploring the outdoors, relaxing in the hot tub and getting to know their Brothers on a deeper and much more personal level. Our barbecue for Homecoming was an incredibly successful gathering for both undergraduate and alumni Brothers. Together, we shared our love for AEPi while rooting on our beloved Bearcats. On October 30, the chapter held a phone-a-thon and text-a-thon, raising $1,100 in less than one hour. This was more money than the last five years of philanthropy combined. We also initiated 12 new Brothers into the chapter. These outstanding young gentlemen are both eager and excited to get involved and simply be members of the greatest brotherhood in the world. This fall, Chi Upsilon has been doing some incredible things. This semester we did date dashes, beach parties, formal and more. The date dashes are always exciting. For Halloween, Chi Upsilon Brothers went to a haunted maze with their dates. The night was filled with fun and fear and everyone involved had a blast. No matter what it is, as long as the Brothers are together, events are always a blast. For formal, the Brothers made their way to Aspen and got a hotel for the weekend. The weekend consisted of trying awesome restaurants and taking in the beautiful views of Aspen. Chi Upsilon is full of an excellent tight-knit group of Brothers who love to have fun and make great memories everywhere they go. 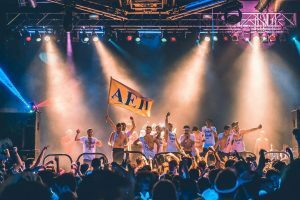 For the second year in a row, AEPi has been the top fundraising fraternity at the University of Connecticut for the HuskyTHON. In total, the Upsilon Kappa chapter raised $28,163.91 for the Connecticut Children’s Medical Center. This is double the amount of the second highest fraternity’s total! We were able to compete with the top fundraising sororities who have more than double the amount of members as we do. 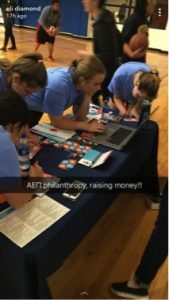 Additionally, Brothers of AEPi who were members of the moral and management team were able to raise an additional $7,452. This put Upsilon Kappa at a grand total of $35,615.91. All of our Brothers are ecstatic to have helped HuskyTHON raise more than $1 million for the first time in its history. 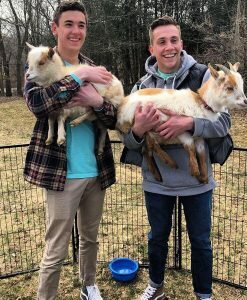 Our spring philanthropy event, AEPetting Zoo, is a wonderful tradition of the chapter. We have been hosting this philanthropy event since 2016. During the event, AEPi welcomes a host of farm animals at one of our off-campus locations. We were happy to come together on this beautiful day with campus and community members of UConn to support Gift of Life Marrow Registry and play with the farm animals. The Brothers of Phi Gamma have had a remarkable semester making a difference on campus while enjoying successful trips with the brotherhood. Connor Haffey (2020), who has just finished his term as master, started a club called Green Greeks with other Greek community members. Realizing as a pledge that Greek life at UF was not very environmentally conscious, he wanted to initiate the movement to promote environmental awareness in our daily lives. Mitchell Goldenberg (2020) has been serving on the executive board of the Gator Blockchain Club at UF since last year. His goal of the club is to promote understanding and awareness of blockchain technology and its capabilities to change our global economy and industries in the future. 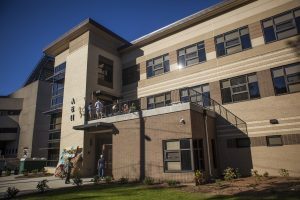 Phi Gamma continues to lead student organizations on campus. Gregory Wolf (2019) is chairman of ACCENT Speakers Bureau, David Rosenthal (2020) is the director of the Homecoming parade and Colin Silverman (2020) is the president of the Jewish Student Union. We are honored to share that this semester, Connor Haffey (2020), Gregory Wolf (2019) and Kyle Rakovitch (2019) were tapped into Florida Blue Key. This is the University of Florida’s most prestigious and oldest honor society. They join Jeff Romer (2019) and Josh Greenspan (2019) who were tapped in the spring. With another successful fall pledge class of about 50 Brothers, we look forward to fulfilling leadership positions on campus. We were thrilled to see a strong alumni presence at our tailgates this semester and look forward to continuing that trend next year. For the sixth year in a row in Guelph, the Eta Theta chapter was proud to organize Splash Bash. Splash Bash is an all ages’ party where paint is sprayed at the crowd of people and Brothers are recruited from the chapter to DJ the event. This is a staple event for Eta Theta, having attendance of more than 700 students from around the southern and Greater Ontario Area. This year was special because with the help of our Brothers, we sold out the 1,000-person capacity venue and created a high demand for tickets. We would like to congratulate all Brothers for such a successful event, but especially the heads of Splash Bash committee Brothers Igal Gorbut (2019) and Daniel Tankus (2020). We have such an appreciation for all Eta Theta Brothers for committing so much time, energy and for hard work to make this event a huge success. 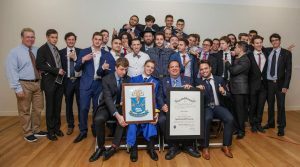 Iota Upsilon Brothers have had a busy, yet undisputedly successful 2018. We began the year by winning Best Delegation at Midwest Conclave for the second year in a row. In April, we executed our highest earning spring philanthropy event, Dog Days, in the chapter’s history. Additionally, we hosted multiple events at the Iowa Hillel to maintain a strong relationship with the growing Jewish community of Iowa City. Over the summer, Brothers held leadership positions at Jewish summer camps across the Midwest. We also sent six Brothers to International Convention in Phoenix, Arizona to learn how to improve our chapter. When the fall semester began, we rushed and initiated eight new Brothers. This brought our total number of chapter Brothers to the highest it has been in more than ten years. After elections, two of these new Brothers now hold executive board positions in the chapter. This is no surprise, as their pledge class helped plan our chapter’s first Rock-a-Thon philanthropy. It has been a successful year for Iota Upsilon, and we are ready to achieve our goals in 2019! Kappa Upsilon has made great progress in chapter growth and development this year. We now have more than 70 Brothers in our chapter after the initiation of our newest pledge class. We hope to expand to 90 by fall 2019. This semester, Kappa Upsilon has hosted numerous philanthropic events and raised more than $10,000 for AEPi’s Official Philanthropy Program and other beneficiaries. Our annual Rock-a-Thon event raised $7,500 alone. We installed our new executive board for the new term last week. This week we were honored to participate in a Chanukah candle lighting at the state capitol with Lieutenant Governor Tracey Mann. With finals around the corner we’re working hard to ensure our academic status remains high as we prepare for next semester. Kappa Upsilon will be celebrating its 70th anniversary in the spring. As we conclude another successful school year and begin to look toward the fall, we reflect on some of the great moments for Omega. We started the semester with a wonderful Parents’ Weekend at the NC Botanical Gardens, where we had our largest turnout yet of more than 130 people. In April, we held our third annual Cones for a Cause philanthropy event with Pi Beta Phi sorority, which keeps attracting awareness and support for Karma for Cara. We were excited to raise almost $7,000, which is our highest amount yet. Just before exams, we all enjoyed a great weekend at our spring formal in Myrtle Beach, South Carolina. We spent most of our time enjoying the sun and spending time with other brothers and our dates. The weekend concluded with a fantastic Italian dinner at Martin’s Restaurant. This spring, we initiated the Kappa Deuteron pledge class as Brothers. These three young men will surely build onto the chapter’s success. 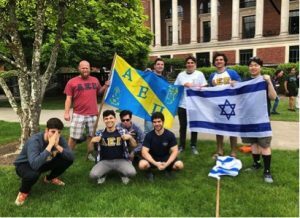 This semester, Brothers continued their involvement at the house and on campus, continually representing AEPi as the only Jewish fraternity on UNC’s campus. We are truly grateful for the strong Jewish community at UNC. We were re-chartered at the University of Pennsylvania on April 15, 2017. We opened our new house this year at 4040 Walnut Street, and it has been a huge success for the chapter! The house has a personalized AEPi pool table, several TVs, an industrial kitchen, a large bar and 26 single bedrooms. During our Dads’ Weekend, we hung a mezuzah on the house made of pieces of the iron dome used to protect Israelis from terrorist threats in the south. Our Brothers love the chef that was hired for the house. Having one gets all of the Brothers together more now than ever before. Thanks to the house, attendance at rush events has been bigger than ever. In November, we had a Gift of Life drive where we helped add one hundred people to the National Bone Marrow Registry. We are looking forward a great rush in the spring. At the end of October, we held a philanthropy event called Trivia Crack. It was based off of the popular mobile game from a few years ago. We asked participants trivia questions. Question categories ranged from movies to music, history and science. Depending on how many questions the participant got correct before they lost, they received more candy. The event was well received on campus, and we had fairly high participation. We recently held an all-Brother Shabbat dinner with kosher food that was cooked entirely by the Brothers. Senior and former master Noah Leibowitz (2019) did a solo performance for the Off-Broadway on Campus organization. The majority of the brotherhood came to view his performance and cheer on the rest of the club. We have also been sending a few Brothers every week to tutor at a local school. The Brothers of Gamma Deuteron had a very successful fall semester. The fall pledge class consists of a geographically diverse group of new Brothers. These Brothers have shown an incredible dedication to the brotherhood and Jewish community during the pledge process and as new members. Gamma Deuteron had a wonderful turnout at its AEPi Shabbat at Texas Hillel this October with Master Nathan Bishop (2021) speaking at the Hillel Shabbat dinner. Our annual philanthropy, Texas AEPi Rock-A-Thon, was incredibly successful and raised more than $11,000 towards the B+ Foundation, a charity assisting families of children with cancer. Brother Jeremy Isaacson (2019) was the philanthropy chairman for the event. Special shout out to Brother Jonathan Shaham (2019), who spent 24 hours rocking in a rocking chair for this cause. Texas AEPI was proud to lead the effort and co-sponsor an event to benefit and remember those lost in the Pittsburgh shooting. All four Jewish Greek organizations helped raise more than $1,000. Our Brothers are very active on all of the University of Texas campuses and are excited for the upcoming spring semester! Tau Iota has had a strong year. 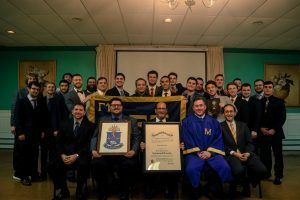 We received our charter on November 18, 2018 and currently have 12 Brothers in the chapter and look to expand even more in the next year. Our brotherhood is heavily involved in campus leadership, with Brothers holding office in groups like Phi Kappa Phi, Collegium V Honors College Student Council, Davidson Management Honors Program, Phi Theta Kappa Honor Society, Hillel at UT Dallas, Golden Key Honor Society and more! We have consistently increased our efforts to improve the Dallas Jewish community through philanthropy and community service. Whether it’s volunteering with Hillel or picking up trash along the highway, Tau Iota is eager to participate. We have raised more than $1,000 for Repair the World and AEPi’s Official Philanthropy Program. Our chapter hosted a marrow drive for Gift of Life at the local synagogue this semester. We have also ranked as the top fraternity GPA among all fraternities at UT Dallas. We look forward to a successful new year! On Saturday, November 17, the Brothers of Tau Omega hosted their annual semi-formal at the Fox in Toronto. Though a joyous occasion, the event has a tragic backstory. In 2012, Tom Samson, an alumnus of the Tau Omega chapter, was struck and killed in the city’s west end. A popular grade two teacher, Tom was an avid, cautious rider who always donned a helmet when riding his treasured hand-me-down bike. On Monday, October 29, The City of Toronto unveiled a public education campaign featuring stories and mementos of pedestrians and cyclists struck on streets and sidewalks, offered by members of Friends and Families for Safe Streets. This was part of their “Vision Zero” plan. Tom’s wallet, keys and wedding band are on display as part of this campaign. The Tom Samson Memorial Gala was born in his honor, with all proceeds supporting his children’s education. With more than 25 brothers and alumni in attendance, as well as their dates, the chapter set the tone for a successful semester. Brother Ben Shnall (2020) said, “It’s always amazing to see the Brothers dressed up and being together for a worthy cause.” The Brothers and alumni of Tau Omega wish each of our fellow Brothers good luck on their upcoming exams and Happy Holidays! This year, Mu Epsilon raised more than $1,000 dollars during our annual Rock-a-Thon event, where one of us has to be sitting in a chair for 24 hours at all times. We initiated seven new Brothers in the fall. Our first-ever MSOE president was elected for this term. We also volunteer at the local Jewish food pantry once a month. Mu Epsilon came together for a great formal at the Osthoff resort in Wisconsin. We also hosted We Walk to Remember on campus, then listened to a Holocaust survivor speak at the local Hillel. We also took part in Shabbat across AEPi. It was a great year for the chapter and we look forward to an even better 2019! Gamma Beta is yet again finishing up another successful and eventful semester. 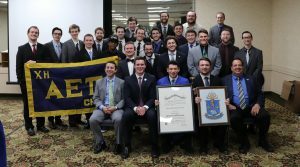 This semester, Gamma Beta received its charter, becoming the first fraternity to be chartered at Wake in nearly two decades. We also initiated five new Brothers to the fraternity and look forward to spring rush. After being the fraternity with the highest GPA last year, we hope to retain this honor for another year. We also claimed our first victory in IM soccer. After our first calendar year since re-founding, we have a lot to be proud of in Detroit. We began in October 2017 with nine founding fathers and have more than doubled to twenty Brothers across Metro Detroit. We have sponsored and participated in countless events with Hillel, Chabad, Students for Israel and more, growing our network and establishing a name for ourselves on campus and in the community. We already have events that have become a tradition, including our ping-pong tournament, annual bowling event and a Shabbat dinner during rush. We hope to find more traditions to create. Our brothers participated in many other extracurricular activities, attending AIPAC’s Policy Conference and Birthright, to name a few. In the coming year we’ll work on expanding our philanthropy programs, building more connections with other Greek organizations and continuing to establish our presence on campus, and across the Greater Detroit area. 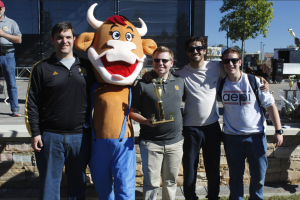 This fall, Mu Lambda successfully raised the most money in the history of the colony at a philanthropy event. We organized a volleyball tournament between sororities and raised $1,500 to benefit the Gift of Life Marrow Registry. Tournament participants also swapped the inside of their cheek to potentially be a match for someone who needs a bone marrow transplant. Brother Zack Levenson (2019) organized a vigil for the Tree of Life Synagogue shooting victims. More than 400 people attended. We recruited and initiated five men into the brotherhood this semester. We now have 17 Brothers and hope to receive our charter and become an official chapter of Alpha Epsilon Pi in the near future! For the first time in more than a decade, we have a chapter house of our own! We had a ribbon-cutting ceremony on October 14 with many esteemed alumni from local chapters in attendance. We can’t thank you enough for donating mementos for the new house. We had a fantastic rush period in September, which included building a sukkah with our local sister sorority, a “BroBQ”, and a party. 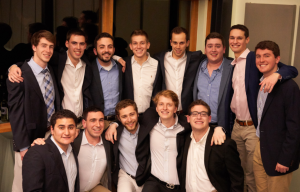 We recently initiated 14 Brothers and are proud to welcome them to our Fraternity: Eric Ackerman, Aaron Bloom, Ronen Cherniavski, Guy Gan, David Gindin, Matanel Glozshtein, Alon Goldberg, Tom Raitsin, Max Ringler, Michael Sidko, Josh Tucker, Ryan Tward, Michael Zubarev, and Michael Zukin. In October, we partnered with Gift of Life to match students with patients who require blood transfusions and bone marrow transplants. Our effort and teamwork helped us swab 400 students and faculty, which was double our initial goal. Here’s to another great term this winter!